Thailand National Park Closures – What Does it Mean For The Future? Thailand is a diverse country with some truly magnificent landscapes. The Thai government has maintained many of these landscapes as part of their National Park network. Notable examples of Thai national parks include Kui Buri National Park near the Burmese border, Mu Ko Ang Thong National Park on the Gulf of Thailand, Khao Sok National Park in Surat province and Ao Phang Na National Park in Southern Thailand. As tourist numbers continue to increase annually in Thailand, the management of these parks and protected areas becomes increasingly complex. The government must address various issues such as pollution, littering, and the effect tourism is having on these delicate ecosystems. In recent months, it has transpired that part of the Phi Phi Islands national park has been closed to tourism – why did this happen and what does this mean for the future of Thailand’s national parks? Why Thailand’s National parks are Seasonally Closed? Thailand is a country that has a varied climate and distinct weather seasons. Due to its position on the equator and its landscape, Thailand actually has three main seasons – hot, cool and wet. The hot season typically runs from March to June, whilst the cool season typically runs from November to February. Finally, the wet season is typically met with monsoons, high rainfall and rough seas – this season can vary annually. Due to this varied weather and seasons, the Thai government actually closes many national parks at certain times during the year. This year, for example, 66 of the 147 national parks will be closed at some point. For example, Doi Luang National Park in Chiang Mai will be closed from the 1st of July through to the 30th of September. These closures are meant to protect the public and tourists during the wet seasons as conditions can become truly unstable and dangerous. Although closures of Thailand’s national parks are common as you can see above, the Thai government recently closed the iconic and popular Maya Bay to tourism. This action went against the grain as it was nothing to do with the weather or dangerous conditions. Maya Bay was closed due to the negative impact tourism had caused. Pollution and litter were becoming a problem and this island in the Phi Phi archipelago was in dire need of a respite. The surrounding coral reef was badly damaged and marine life had all but vanished from the seas. Effectively, the government closed Maya Bay to allow its ecosystem and natural landscape to recover from the effects of persistent tourism, regardless of the impact this would have on sales, and income from the island. Although only closed for a four-month period, the locals of Koh Phi Phi have done what they can to clean up Maya bay and try and bring back its original natural beauty. Only time will tell if this partial closure will do the trick but there are many people who argue that nothing short of a permanent closure will repair the damage we have done. Reduce single use plastic on your travels. What Can we Expect in the Future for Thailand’s National Parks? This incident at Maya Bay is one of several where the Thai government has had to re-assess its strategy and consider the harmful impact mass tourism is having on its natural habitats. It is clear that something needs to change. 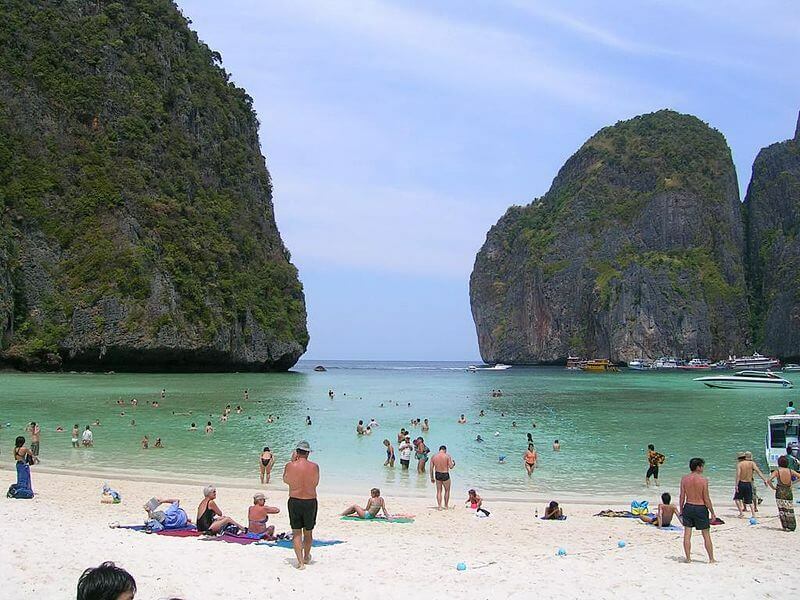 If areas such as Maya Bay continue to be subject to mass tourism, much of the beauty of Thailand will simply disappear. This presents an extremely difficult situation – tourism is a huge part of the Thai economy, but can we continue to let tourism destroy iconic locations such as Maya Bay and the Phi Phi Islands? We hope you have found this information enlightening. As you can see, the Thai government is changing their approach to the national park management. It is clear that in the near future, continued thought must be given to cases like Maya Bay and the Phi Phi Islands if Thailand wishes to protect its areas of natural beauty. Thailand Real Estate Agency. Tailored support for overseas property buyers in all of Thailand’s major property hotspots.